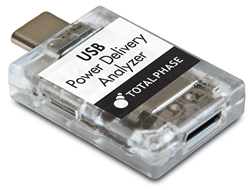 Total Phase, a provider of industry-leading USB, I2C, SPI, eSPI and CAN embedded systems tools, announced that the Total Phase Data Center™ Software (https://www.totalphase.com/products/data-center/) now includes support for the Total Phase USB Power Delivery Analyzer (http://www.totalphase.com/products/usb-power-delivery-analyzer). By building on the award-winning Data Center Software, this update enables engineers using Windows, Mac OS X, or Linux platforms to analyze the Power Delivery protocol, which is a fundamental part of most USB Type-C™ products. Users can sniff the CC1 and CC2 signals to easily and inexpensively gain visibility into the Power Delivery negotiations of Type-C products, regardless of their development environment. The Power Delivery Analyzer’s USB 3.1 Gen2 data pass-through enables recording without disturbing other high-speed signals. Total Phase manufactures user-friendly, powerful, and affordable USB, I2C, SPI, eSPI and CAN development tools for embedded systems engineers. Total Phase tools combine best-of-breed features, Windows, Linux, and Mac OS X support, a royalty-free API, and excellent customer support, making them perfect additions to any engineer's toolbox.